I'm about to replace my stolen stereo and get my rear 6x9s wired in. I don't think my car has the wiring for rear speakers. Can anyone tell me the route the wiring takes? Down the passenger side carpet? Which holes does it come out of in the boot? Also which path does it take around the rear hatch? The stereo I'm getting is a Sony MEX-GS820BT. Would I need to upgrade the power wires? The manual states rated power consumption 10A. Be careful fitting anything with a CD deck in in a 2f, they can be too deep for the space in the dashboard. Mine is down underneath the front carpets and then routes up behind the rear panel cards, popping out around the rear seatbelt fixings. However it is a breadvan - what bodyshape is your 2F? In the breadies there are two plastic mouldings that the rear speakers sit in - the same mouldings also serve as a place for the parcel shelf bushings to sit in. Would I need to upgrade the power wires? The manual states rated power consumption 10A. I don't think so, although perhaps someone who has done more car audio could provide a better answer. If it draws 10A of current the stereo would be using 120W+ of electical power which is no mean feat. I expect the rating will just be the maximum (i.e. the fuse rating) - in which case (and I may be wrong - do check!) 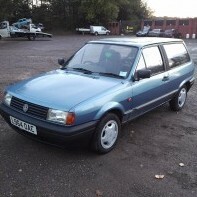 the fuse in your polo may well be the same or higher, in which case there should be a need to install thicker power cables. What do you reckon? Too deep, or will I be OK? Another though, looking at the front of the Sony, it's volume dial does not sit flush like the Panasonic, it protudes out slightly. This might account for the extra depth? Has 4 x 45W RMS class-D amplifier stage (4x100W peak). For 10 amps and a short length of wire AWG-8 to AWG-10 wire - or about 5mm2 cross section should do --- same for earth of course. I hope it is efficient (class-D usually are) or the heat sink will melt its way through the dashboard to make itself fit. Actually yeah, depth is probably the volume control sticking out. Yes I think I know where you mean, along the passenger side sill, under the door and up and over the wheelarch, behind the doorcard? Does the driver's side speaker wire run along the passenger side as well? Or is it routed under the drivers carpet? If the driver's side speaker runs down the passenger side, what route does it use to cross sides? Along the bottom of the rear hatch, or inbetween the boot carpet and the back seat? I have a coupe. Looking in the rear hatch, there's a circular hole - is this where the wiring would come out? Also what gauge wire would people reccomend? According to the below it would be 1mm for a 5m run? I forgot to say IIRC the parcel shelf supports are similar in breadys and coupes - there are speaker grille's for 4x6 speakers. Mine didn't have any speakers fitted when new. They screw over the plastic posts. Although you could also apparently run a die up them and use some normal nuts eh. 1mm audio wire sounds fine - don't think you'd need anything special to drive 4x6's over that kind of distance. Thanks for the link. Unfortunately he's out of stick, but working on getting some new nuts. I've decided to keep with my 6x9s till I get an underseat sub though. 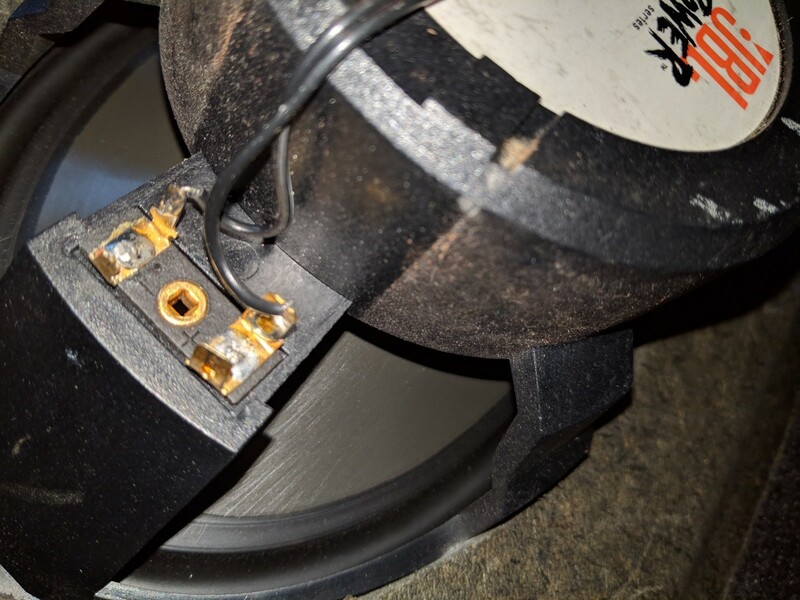 A couple of the spade connectors on my speakers have snapped with being disconnected and reconnected many times. Do you know anyone that sells spares tht I could solder on? I think the fast-on connector is the one to go for. I just need to get the correct size. It's the skinny one that has snapped - it's most likely metal fatigue from the speakers being disconected and reconnected numerous times. I have the head unit now. It's a heavy beast! - over a kilo. The only annoyance so far is the EU version doesn't have two USB inputs, only one on the front. I was hoping to use both and have a thumb drive hidden away on the second with loads of music! I can't see why they removed it compared to the other versions. I'd rather have 2 ports and sacrifice radio 4 on LW. 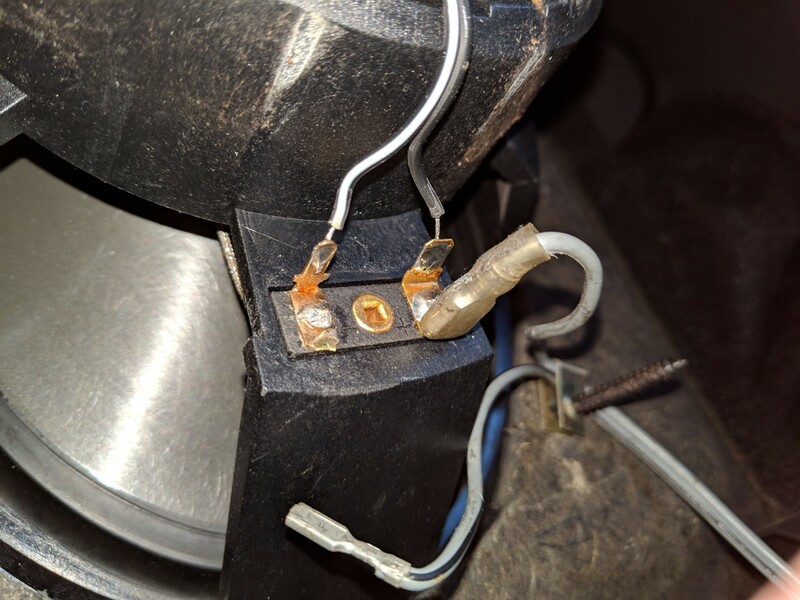 Here are the snapped connectors on the back of the speakers. It's the thinner negative ones.